So you've come to TDA to request some sort of graphic. This basic tutorial will show you how it's done. Take careful note of what type of graphic you want to request. 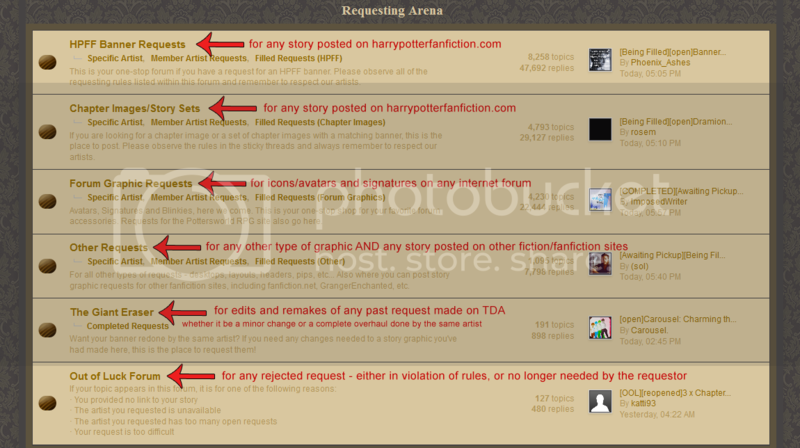 The "HPFF Banner Requests" area is only for any story posted on harrypotterfanfiction.com - this means that if you want to request for a story posted on any other site, you must post it in "Other Requests". All requests made on TDA must include a link to the site where you will use the graphic. No link - no graphic! HPFF Banners: link to the story summary page (example). The story must have at least one validated chapter. HPFF Chapter Images: link to the individual chapter. The chapter where you will use the image must be validated. Forum Graphics: link to your profile page (example). If the site cannot be seen by guests, you must take a screencapture of your profile instead. Other Graphics: provide whatever applicable link you can. The only exception is for desktop wallpapers or any type of graphic for personal, offline use. General Requests: these are open for any Junior, Senior, Graduate, and Staff artists to fill. Specific Requests: if you only want a particular artist or group of artists to fill your request. Member Artist Requests: after 24 hours or more of sitting in general requests, you may ask to have your request moved here for any Member Artist to fill. 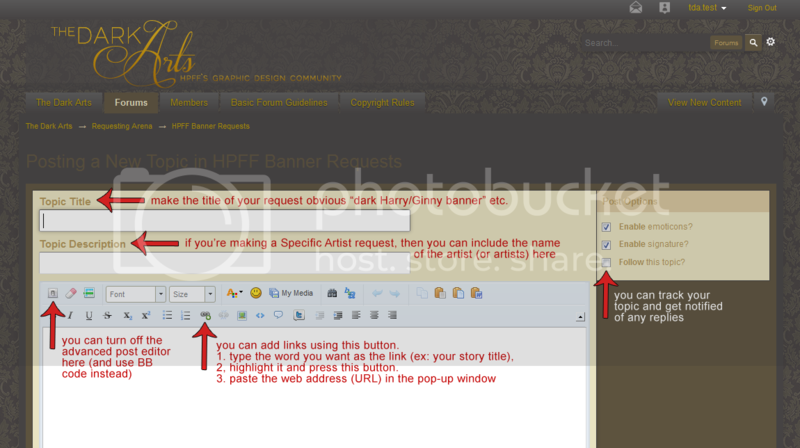 Because HPFF banners are our most popular requests, the remainder of this tutorial will be specific to that area. To make a new request, first click on "Complete Rule Guide & Request Forms". Please read the rules so that your request can be opened and filled as soon as possible! Hit "back" on your browser and click on the "Start a New Topic" button found at the top right of the list of topics. Please do not add [open] to your request's title - the moderators will add that once they check over your request to make sure that 1) it follows the rules, and 2) all the links and images work. The rules posted in each requesting forum explain what you do with your request once it's posted. Another important topic to take note of is Where to Find Images - it contains lists of sites with image galleries. TDA also has its own gallery of images that are perfect for requests: TDA Resources. The Giant Eraser forum is for any changes, be they major or minor, on any graphic you have requested on TDA. If you requested a graphic some time ago (months, or even years), and the artist is still active, you may ask them to remake the graphic entirely. Or, perhaps you only need a small change - a different quote or different image. For either of these cases, you can use this forum. We ask that you use the Giant Eraser rather than requesting changes in private (via PM) so that we can make sure that the final graphic still follows the rules, particularly of HPFF. The Giant Eraser was originally made for remaking old HPFF banners, but with some adjustments to the request forms, you can make it useful for any type of graphic. The "Up For Grabs" area is of particular interest to those who do not want to wait for a request to be filled and for those who have no specific design in mind. Here, artists have posted graphics that need homes - to be honest, it's an adoption centre for graphics, from desktops to forum graphics, banners, and chapter images. If you have any questions at all, don't hesitate to post in the Q&A forum.